Two new subdivisions in the Crown Isle Golf Course and Resort Community are now under construction with roadworks and site preparation well under way. The RISE Phase III & IV (69 Lots total) are scheduled to be completed sometime in June or early July, followed by the final extension of Crown Isle Drive – Cambridge Park Estates Phases V & VI (67 Lots total) – with registration expected in the late fall. Developers plan to begin site construction on Phase III of The Ridge in April or May of 2018. The success of the first 2 phases of this development has brought many new residents to this welcoming neighbourhood. New home owners have come from many places, including from the Comox Valley, Vancouver Island, Victoria, Vancouver and the mainland, Alberta, Ontario and other places. 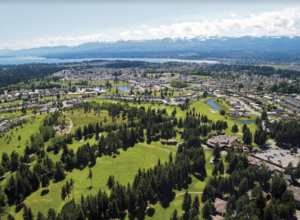 Crown Isle Resort and Golf Community – 25 Years and Still Growing! The Crown Isle Resort and Golf Community is celebrating 25 years! The first homes in the Crown Isle Resort & Golf Community were constructed over 25 years ago and the community continues to grow as a master-planned community that has stood the test of time. The owners and development team behind this prestigious real estate development believe much of the community’s success can be attributed its Registered Building Scheme & Design Guidelines which have ensured consistency and quality from the beginning, while helping to maintain property values within the master-planned golf community. Grand Legacy Homes is one of the latest Comox Valley home builders to build new homes at The Ridge. They have just completed a five-bedroom, three-bathroom home located at 3427 Eagleview Crescent. This two-storey home is perfectly situated within the subdivision to have both mountain and ocean views. It is also located very close to the community park. This spacious home by Grand Legacy Homes is 2,650 sq. ft. and is listed for sale for $683,900. Find out more by going to MLS #434563. Grand Legacy Homes is planning to build more new homes in Phase II at The Ridge on lots 9, 15, 16.